This is no doubt the most beautiful album I have heard this year, and maybe even in many years. 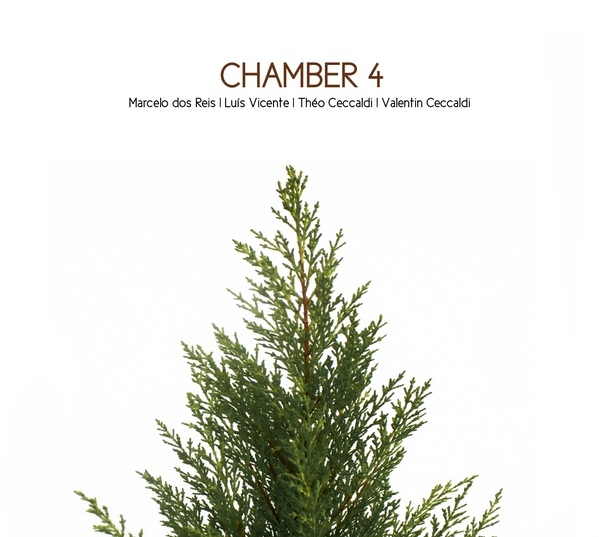 It is a chamber jazz quartet with Luis Vicente on trumpet, Theo Ceccaldi on violin and viola, Valentin Ceccaldi on cello and voice, and Marcelo Dos Reis on guitar and prepared guitar. You will recognise the similarity with the band "Deux Maisons" who already released "For Sale", a magnificent album, earlier this year, but now we have the minor change of percussion being exchanged for guitar. What I wrote some years ago for "Clocks & Clouds" another band with Luis Vicente, is also valid for this one : "You can rationalise it any way you want, but some people just have 'it', and this 'it' is the unnameable gene of musical sensitivity, the undecipherable element of sonic quality, the unfathomable depth of creative art, the enigmatic possession of sound, the ineffable mysticism of spontaneous interaction, the puzzling poetry of polychromatic pointillism, the baffling blasts of beatic beauty, the hermetic harmonies of hoarse hymns, the syncretic swing of soaring songs. You get it. These guys have it. In spades." On "Green Leafs" (sic), the three string instruments offer a backdrop of hypnotic intensity for the soaring trumpet, if they are not engaged in some fierce battles around a tonal center. "Timber Bells" starts with melancholy or even romantic violin, with sparse plucked cello sounds, opening a strange vibrating and hesitating dialogue with the trumpet, slowly evolving into "Some Trees", on which muted and highly resonating attacks on the acoustic guitar change the nature of the music, allowing the dark cello in with more voice and power, while the violin keeps on its eery high flight. Contrasts between light and darkness emerge, between vulnerability and solidity, a context which turns completely into a wild frenetic collision between all four instruments, wild and energetic. "Wooden Floor" is more abstract, beginning with an intro with high intervals, supported by arpeggiated chords on the guitar, and when violin and trumpet find each other in high repetitive and almost identical phrases, the tension mounts, the energy builds up, as if agony and despair drive the sounds inexorably forward, unwilling but relentlessly, turning into some magnificent symphony of purity with the soaring violin trying to escape the dark undercurrent created by the other instruments, then the intensity disappears and muted horn and muted guitar strings dialogue over a bowed cello, full of deep emotions and quiet resignation, almost bluesy and one of the most beautiful trumpet-cello duets ever heard, until the trumpet goes into mute squeals of pain, and guitar and violin join again, again altering the atmosphere into a more soothing and appeasing finale of subtle low density interaction. "Lumber Voice", the last track, starts with viola, and the acoustic guitar offers a rhythmic and harmonic foundation for the trumpet to join. The intensity increases, as do the emotions, especially because of Vicente's wonderful and soulful trumpet playing, contrasting strongly with Theo Ceccaldi's repetitive and austere viola phrases. And then, all of a sudden, a human voice comes up, no two voices, wordless and serene and solemn, humanising the improvisation even more, increasing the pitch and intensity into high wails, the crying of humanity, utterly devastating and unnerving. What more can I say? This is one of the best albums I've heard in many years, an incredibly strong combination of avant-garde form with deep and soulful emotions, full of rich ideas, superb musicianship and interaction. It is relatively unique in its musical vision, full of contrasts of light and darkness, tight interplay and incredible focus within the improvisations. The combination of classical sounds with jazz, all brought in a free improv mode, and turning it all into something new, something unheard, is amazing. I seem to run out of superlatives to describe what I'm hearing. You wish this music could go on forever. I agree: a significant album, which genuinely deserves its rating. Yes, I also agree. I received the album yesterday, so with only hearing the album once I think it is to early to say it's one of the best from last years, but I was very impressed when I heard it. 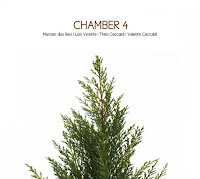 With the also impressive For Sale album it is clear Luis Vicente and the Ceccaldi brothers are having one hell of a year. Anything that features Marcelo dos Reis is worth some attention, in my opinion. I’d also recommend “Zero Sum” by Fail Better!, which Stef reviewed last year, and “Xisto”. Beautiful and captivating, both.